If you ever asked Wade Westin, “What’s new in Medora?” you’d be answered with an enthusiastic listing of attractions, events, and local hang-outs that he was bursting to share. Wade loved Medora and the North Dakota Badlands, and as the Marketing and PR Director of the Theodore Roosevelt Medora Foundation, he was constantly brainstorming for fun and unique experiences that Medora could offer. A combination of Wade’s interest in running and his love of the majestic Badlands led to the idea for a trail run along the Maah Daah Hey Trail near Medora. Mark Zimmerman, currently the Director of the North Dakota Parks and Recreation Department, remembers talking about the possibilities with Wade when traveling together to various sport and tourism shows in the winter months. At the time, Zimmerman was working as the Outdoor Recreation Specialist for North Dakota Tourism. He loved the idea of promoting the Maah Daah Hey Trail as a place for not only horseback riding, hiking, and biking, but for running as well. Zimmerman points out that the Badlands Trail Run can be challenging to runners used to flatter surfaces. He notes that many of the races in Bismarck-Mandan are held on pavement or well-worn trails, and that the terrain and grade of the trail on the Maah Daah Hey is tougher than a typical 5K/10K race in North Dakota. In the summer of 2007, a road race was added to Medora’s calendar of events. The “Bully Run”, named after Teddy Roosevelt’s trademark saying, took runners through the streets of Medora and on roads and bike paths on the edge of town. As word of the races spread, the number of participants in each 5K walk/run and 10K run events grew from 70 to 100 to closer to 150. Still small enough to be timed with hand timers and to have organizers shout out last-minute instructions without a mic, the races have a small town feel and a friendly atmosphere. Wade’s co-worker Ann Riippa soon took on many of the administrative and organizational responsibilities of the races in order to help share Wade’s many responsibilities in the marketing department. A runner as well, Ann felt the races were ideal for runners of all ages and abilities. “The Medora races are all about enjoying being out in the Badlands and having a fun time. It’s a great place for new runners to come out and try their first race.” (This blogger gives a review of their experience with the Badlands Trail Run.) The events have gained a following in the running world, too: the Badlands Trail Run was recently featured in Trail Runners Magazine – click here to read the full 4-page article. 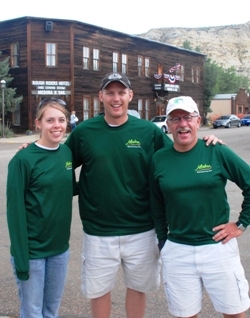 Ann Riippa, Wade Westin, and Mark Zimmerman (l-r) pose in downtown Medora following the 2008 Badlands Trail Run, Wade’s last Medora race before passing away in February 2009. With Wade’s sudden passing in 2009, family, friends, and co-workers were looking for significant ways to honor his caring and adventurous spirit. One clear way to do that was for the Medora Foundation to continue hosting race events, an effort still led by Ann Riippa. 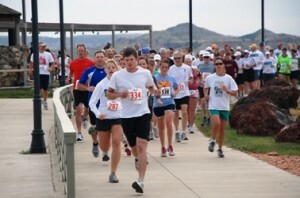 The seventh annual Badlands Trail Run is schedule for August 25, 2012. Runners and walkers receive a sweat-wicking t-shirt and buffet lunch ticket as part of registration fees. Register ahead of time to ensure a t-shirt will be available for you the day of the race.